﻿ Why You Should Make Last Year’s Donation Season Your Biggest Rival » Red Mango Marketing! Competition is powerful. A joke in the sailing world says that any time two sailboats see each other it turns into a race. You can turn your marketing strategy into a game, either with your team or by yourself, and place a reward on the other side of a stated finish line. Making the finish line real, with a specific deadline, automatically turns up the competition. 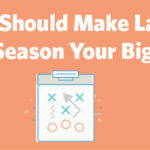 The post Why You Should Make Last Year’s Donation Season Your Biggest Rival appeared first on Constant Contact Blogs. This entry was posted on Thursday, October 4th, 2018 at 8:00 am	and is filed under Email Marketing, News & Updates, Nonprofit. You can follow any responses to this entry through the RSS 2.0 feed. Both comments and pings are currently closed.